Jocelyn and I have reached the end of another “Father and Daughter Adventure”. Monday afternoon Atomic shuttle picked us up from Cromwell for our 424 km (255 miles) return to Christchurch. We will save this long cycle ride for another day. The shuttle driver stopped at Lake Pukaki for a wonderful view of the lake with Mt Cook in the background. At 3754 m (11,262 feet) Mt. Cook is the tallest mountain in New Zealand. We continued on to Lake Tekapo. These glacier lakes have such a bright color to them. I have never seen such blue water before. 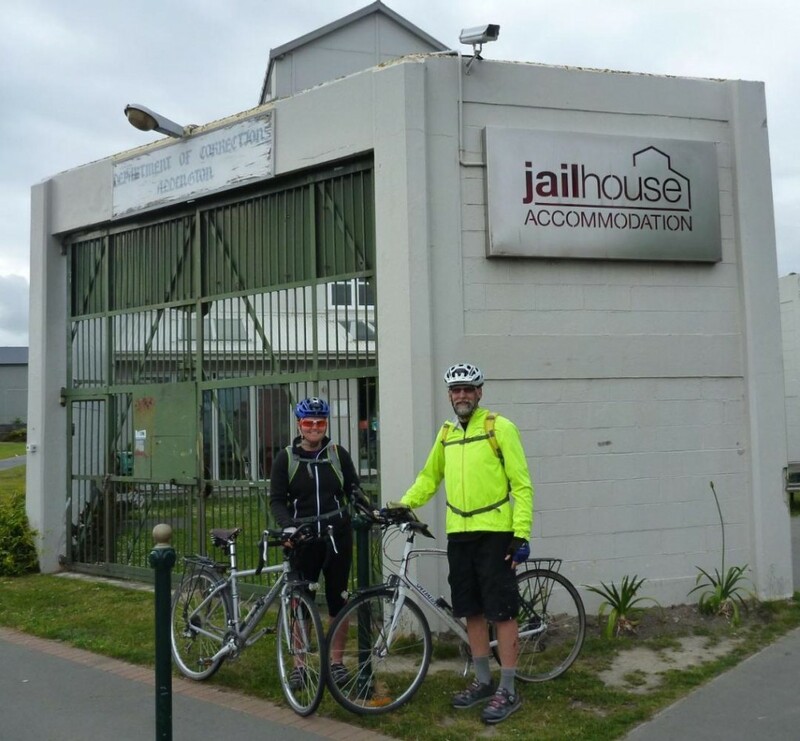 After 11pm we reached our Christchurch destination of Jailhouse Backpackers. This backpacker was a real jail that was built in 1874. 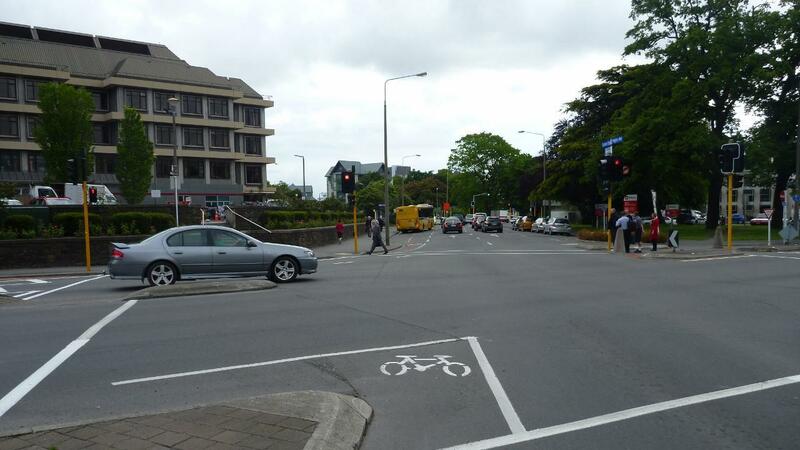 On Tuesday morning we rode through downtown Christchurch to return the bikes to Natural High. It was a rude awakening driving the 8 miles through rush hour. Without family and friends to greet us it was pretty anticlimactic. Jeremy removed our equipment from the bikes then we took a taxi ride to the US Antarctic Center where I picked up a duffel bag I had stored. 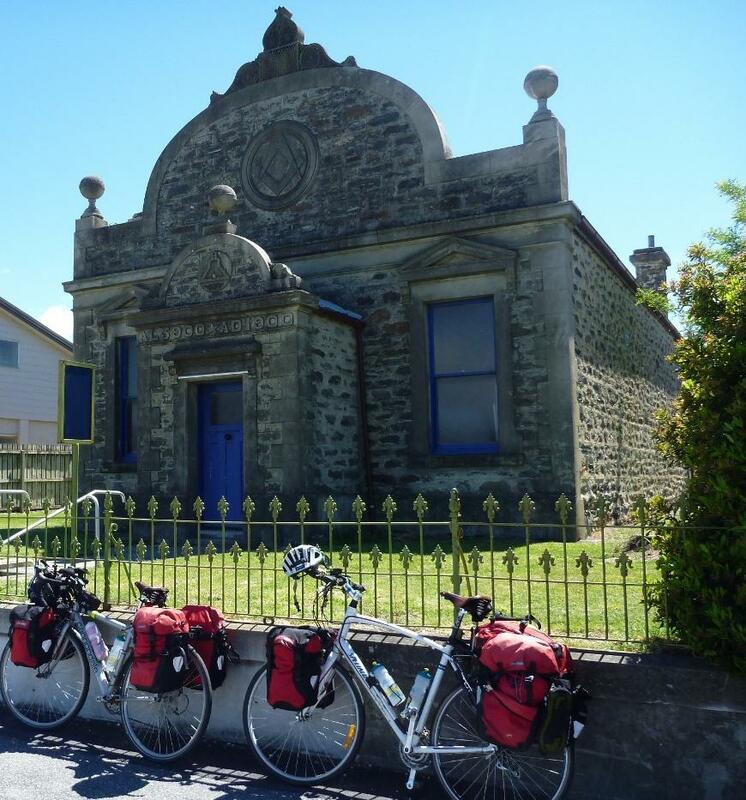 After that it was back to the Jailhouse where we packed up two duffel bags full of bike gear then took another taxi to a local post office for mailing back to Florida. Then it was to a grocery store and back to the Jailhouse. What a long and successful end of our journey! Last year when we crossed America from Florida to California I never would have thought that the following year we would be cycle touring New Zealand. Thanks to my Antarctic adventure for leading us to this destination. It has been a trip with many difficult but rewarding rides. From reading many biking blogs I knew the hills and weather would be challenging but I never imagined to what extent. At times the everyday climbing seemed insurmountable but with the right attitude we took each hill and mountain foot by foot. There was new meaning to the Kiwi term of calling a bicycle a “push bike” as there were times we literally pushed our bikes over a steep hill or mountain. We spent over two hours pushing our bikes to the top of 1900 foot Haast Pass, which isn’t that high but very steep. Several people commented that we biked the “wrong way” over the pass. But we survived foot by foot and the rise seemed endless at the time. Our highest climb was over 3900 feet but over the course of several hours so we were able to stay on the saddle. Overall our total ascent was over 38,000 feet. That is a lot of “ups and downs”! I never would have imagined us cycling in near hurricane force winds but we did although sometimes we had to walk the bikes to stay out of the road. The windy passes made for some exhilarating descents although peddling hard to get down a steep hill was sometimes demoralizing as the reward for climbing a steep hill is the so called easy descent. There were several times we had to do this. The tales of heavy rain on the West (aka Wet) Coast didn’t disappoint and with the proper rain gear we survived. The sandflies really were not in “bloom” yet so we survived those okay except that Jocelyn was affected more than I was. We were prepared with mosquito netting but never used it. The weather was kind to us, except that we would have enjoyed it warmer. All the locals that we talked to said it was very unseasonable and that the cooler weather would normally have passed by now as New Zealand is well into spring. It was cool or cold in most areas and we couldn’t imagine camping on the cold ground. Because of that and the weight of all the gear we mailed the hired gear back to Christchurch after our first climb into Hanmer Springs. 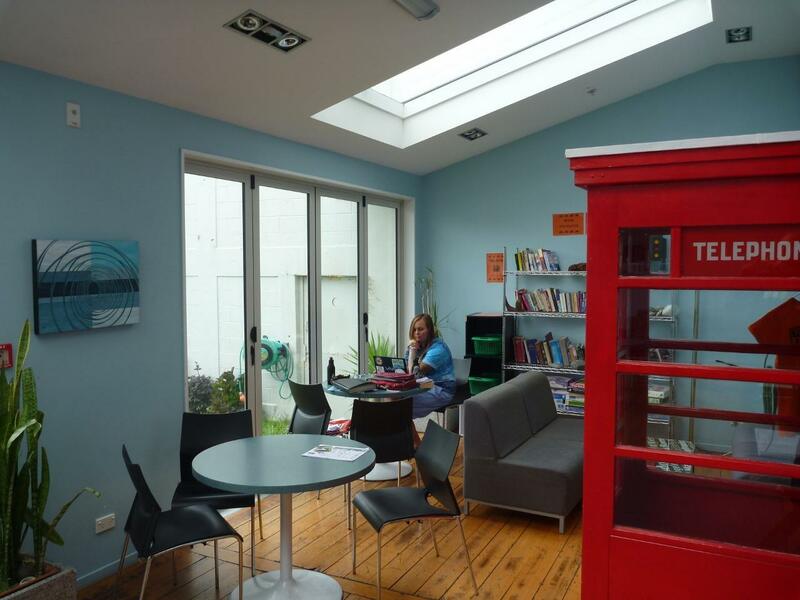 While there we experienced our first backpackers (hostel) and figured this would be a fun and affordable alternative. Weather: October and November should have been warmer. The rain was kind to us but the wind was very challenging as we expected. Hills: A lot more than what I expected. As a result our daily mileage was much less than planned. I was okay with that and to see all that we wanted we made up time with four bus trips. The people: I can’t say enough of how much we enjoyed talking with and living among the New Zealand people. Except for a few rare times we felt very comfortable with their kindness and generosity. I never hesitated to ask for help or directions. Although never try to outdrink a Kiwi at the local pub as it just won’t happen. 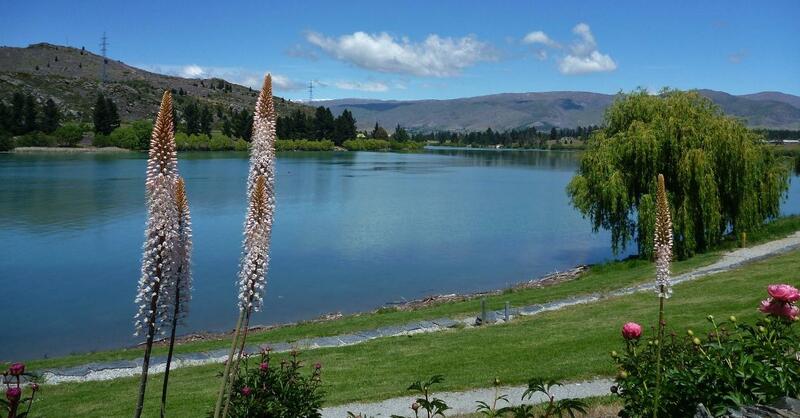 Favorite town: Wanaka which is such a pretty and laid back lakeside community. Along with that it has a really cool sailing scene. Currency: New Zealand is very smart when it comes to bills and coins. There are no $1 bills or pennies or nickles. Instead there are $1 and $2 coins along with 10, 20, and 50 cent coins which do not get worn like the bills plus prices are rounded up or down so no pennies are needed. Very smart indeed. 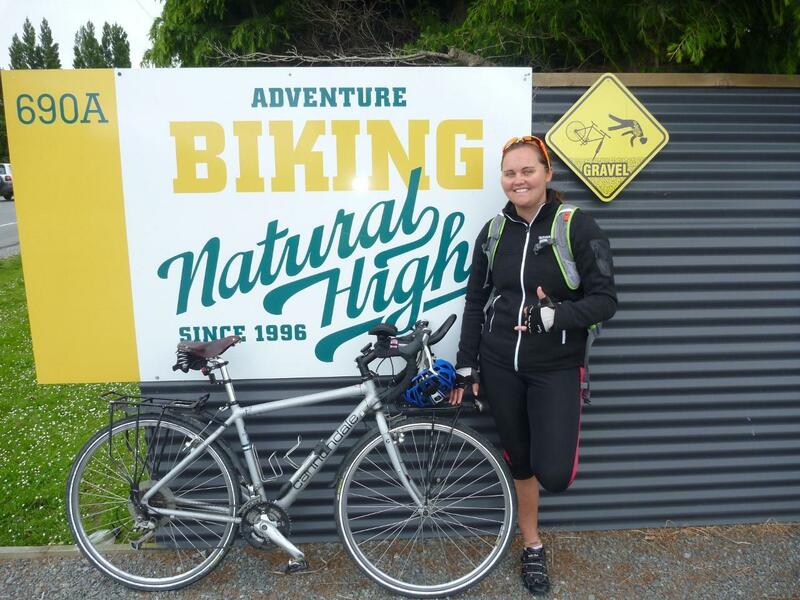 Our trip: Originally I had planned a 42 day 2,000 mile ride around most of the South Island. As I have said early on I knew that wasn’t going to happen. 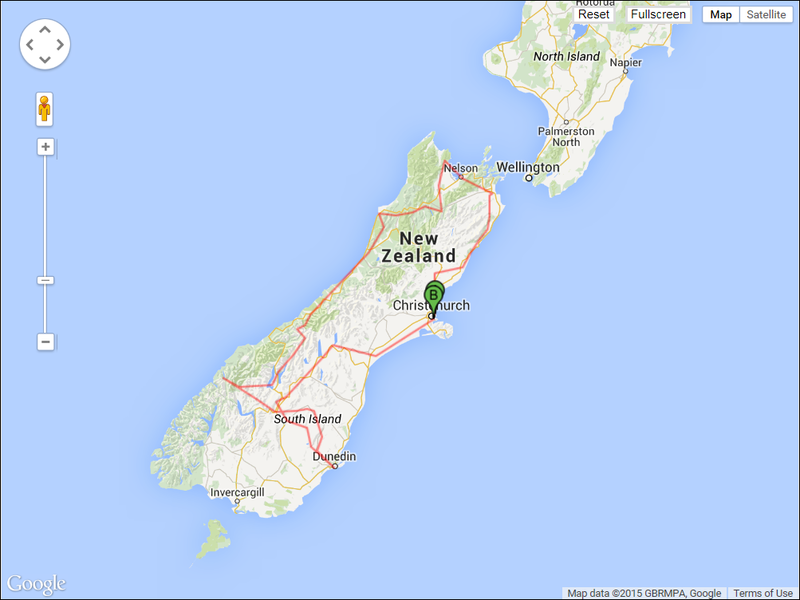 We instead covered all of the planned areas except for one, Picton and Queen Charlotte Sound in the north as we wanted to spend more time at Able Tasman National Park and the West coast. We were able to cover all the areas by utilizing a shuttle bus four times. We bussed from Blenheim to Nelson (120 km, 72 miles), Hokitika to Fox Glacier (160 km, 96 miles), Queenstown to Dunedin (282 km, 170 miles), and Cromwell to Christchurch (425 km, 255 miles). The total is about 1000 km or 600 miles. This is interesting because if you add our total riding miles of around 1100 to the bus miles of 600 it is close to the planned 2000 miles. Without utilizing the bus we would have missed large areas. 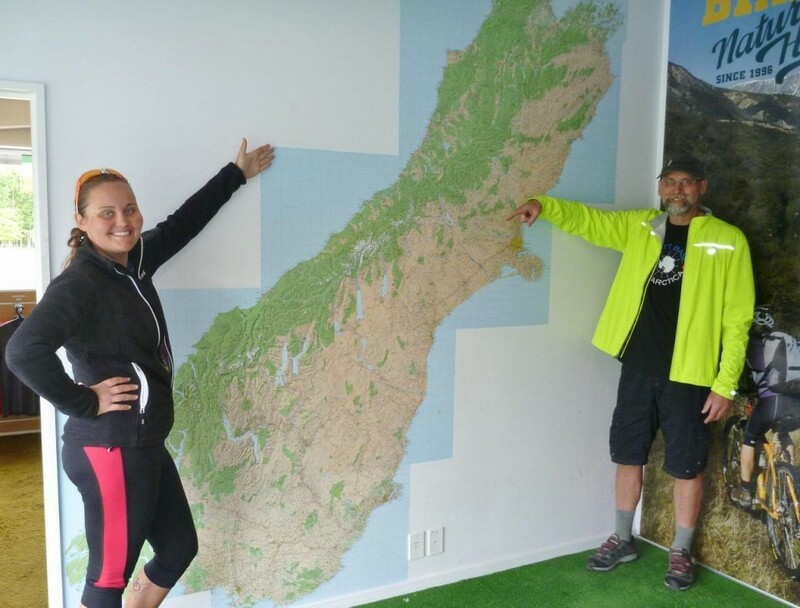 Also we had originally planned to ride the 300 km, 180 miles from Queenstown to Milford Sound and bus out so that puts it pretty close to the 2000 miles. As it turned out we rode some of the best rides New Zealand has to offer. Bus companies: We used three. InterCity Bus Line is not bicycle friendly at all. A bicycle space cannot be reserved so whether the bike can be taken is at the whim of the driver. We not only experienced this but also heard the same thing from other riders. We also hired Atomic Shuttle and Connexions Bus. Both of these will accept bike reservations and are very biker friendly. Accommodations: We spent almost every night in a backpacker (hostel) and were always able to obtain a twin private room with shared toilet/shower facilities. When one wasn’t available we stayed in a motel or campground that was equipped with cabins as most are. The backpackers are fun and affordable. They are like staying in a different house every night. Most have fireplaces or wood burning heaters which I serviced most happily as I really like wood fires. None of them had a propane gas assisted start like mine at home so my fire starting skills increased. We would either eat out or if a grocery store were nearby we would shop and cook. The dinner scene at these backpackers can be very fun and enlightening with many different nationalities “cooking up a storm” at once. We just had to get in there and get it done sometimes! I have always been a pretty quiet guy but I really enjoyed talking with so many different people. I remember one backpacker in Fox Glacier where a large group of Danish girls appeared one day. There must have been 15 of them and all blond. Jocelyn questioned why I was staring at them and I told her I had never seen so many young blond girls (and I mean real blond) at one time. It really was quite a sight! The roads: For the most part all the roads we traveled on were in good condition although a wider shoulder would have been nice. To the left of the white line it quickly became loose gravel. 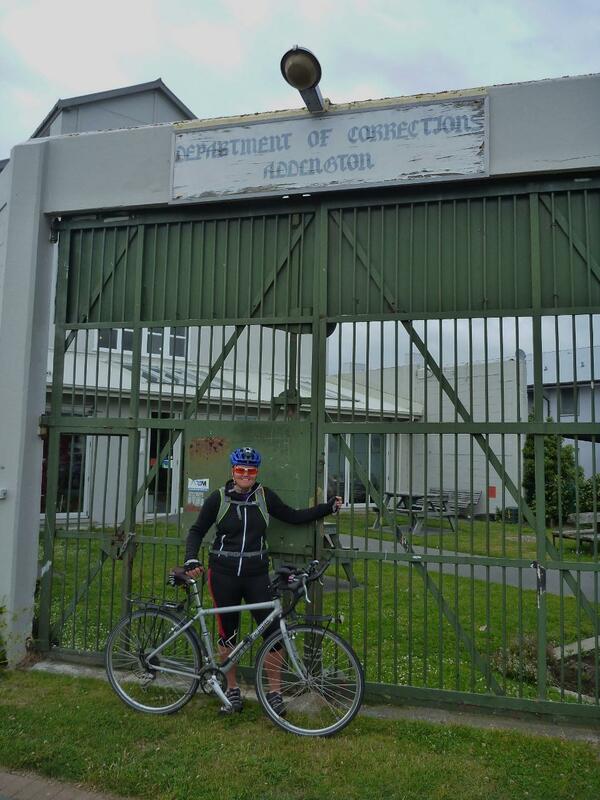 The Otago Rail Trail was all gravel with varying degrees of gravel size and distribution. It was very muddy and wavering one day. We could ride abreast or in a single lane as there are no vehicles allowed. There are other bikers, hikers, and horses. Drivers: Once again for the most part the drivers were very courteous and gave us wide berth since there was little to no shoulder for most of the South Island. The dairy truck drivers are very fast and do not like to move over even if there is not any oncoming traffic. I was run off the road three times, twice by trucks. Fortunately I only fell once on an uphill road to Wanaka. After a few days rest in Queenstown I was fine. The tourist’s campervans crazy driving that I had read about never happened. Maybe it was because the season hasn’t really started yet. We never rode on a motorway and pretty much kept off of the major roads except for the West Coast where the only way up or down is on SH6. Hitchhiking: We did manage to hitch short rides twice, once when it was getting late on the way to Kaikoura and there were no accommodations and again when I hurt my back when I fell. Food: While in the Antarctic for the winter I changed my eating habits to vegetarian and pretty much stayed that way in New Zealand. Jocelyn decided to become one also. After a few weeks of seeing “bangers and mash” on the pub menus I really wanted to try it. So I did and it was delicious but I haven’t touched meat since. We ate lots of excellent grilled and baked fish, fish and chips, seafood chowders, scallops and mussels, salads, and vegetarian quiches and nachos. And of course we ate whatever we wanted because we were burning calories. Favorite ride: There were so many great scenic vistas but my favorite was after the town of Charleston on the West Coast. We climbed three steep hills with each hill having several peaks. After the last one we were totally exhausted and even the fast downhill descent was hurting with the headwinds. But soon we were on the coast to one of the most fantastic scenes I have ever cycled in to as the West Coast revealed beautiful palm trees and a rock bound coast with crashing waves. I thought we had ridden into Jurassic Park! We stopped many times and just marveled at the beauty and power. Beer and Wine: The huge variety of small and large operations is amazing. 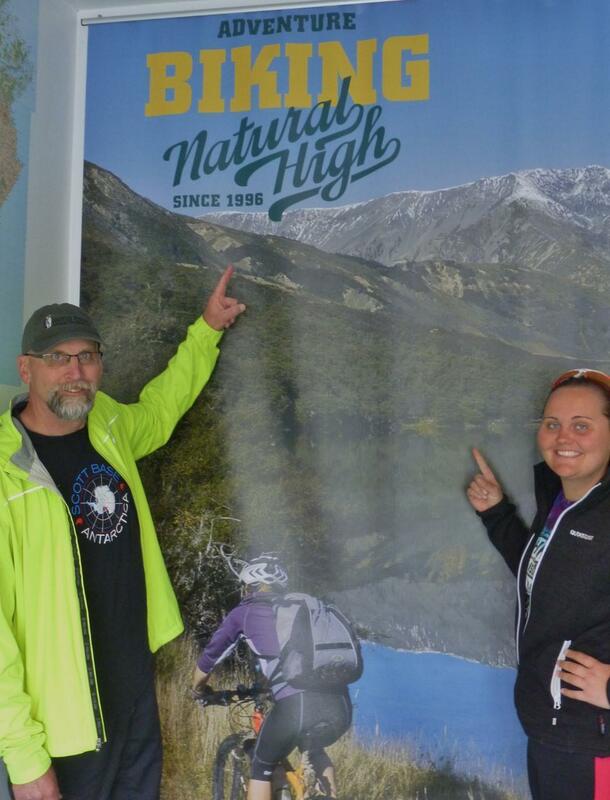 We toured two breweries along with several winery tastings. We had so many different types and flavors of both. One of my favorites was any beer from Monteiths Brewery in Greymouth. When we were really thirsty we stuck with several flavors of Speight’s beer. The Central Otago Pinot Noirs were also great. Father and Daughter: Once again we did well together. Jocelyn kept me on the left side of the road when I strayed. It didn’t take long getting used to the other side of the road but some mornings I got on the wrong side. She watched over me. Last year she was usually in the lead but this time I was at point. I knew it was time for a break when she gave me the look or was all of a sudden quiet. We had good times together but occasionally we needed our own space and were sometimes spread apart. Some of the rides were talkative and some were plain quiet as we absorbed the beauty. At times one of us would just stop and would not start again until we were ready. The other knew to just wait. It was really good that we could talk to other people in the backpackers. But through it all we never complained of the daily routine of getting back on the road. It became second nature and we greeted each morning as a new day of discovery. The locals: The cows, sheep, bulls, llamas, deer, horses, pigs, rabbits and dogs were everywhere and I enjoyed stopping to watch them. What is interesting is that we were never chased by a dog even though there were many on the loose. And we never saw a lizard or snake although we were in some desert like areas. I would like to thank my wife, Andee, for her understanding with this adventure. I have only been home for the month of January in the past 15 months. It is past time to go home for a while and maybe plan an adventure for us. I would also like to thank my son Cary for looking after things at the house. My love to them both. And I would like to thank Jocelyn for putting up with her dad and protecting me. We did it again and had fun exploring together! 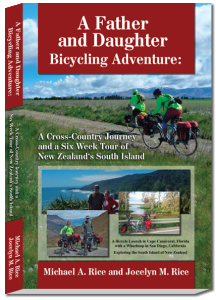 While spending the past winter in the Antarctic I wrote a book about our first cross country adventure. It is now in the editing stage and I hope to publish it soon. In the meantime where will we go next? We have thought about Southeast Asia, South America, Africa, and Europe. Or maybe we will cross the country again on a more northern route. Dad – we kept the wheels going around and around once again! Mom and Dad – thanks for watching over us. 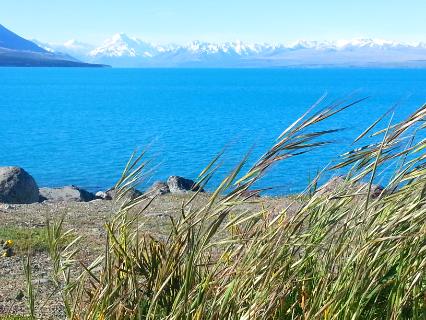 Lake Pukaki and Mt. Cook. Mt. Cook (right of the middle) 11,262 feet as seen from Lake Pukaki. We are spending a few days at the Jailhouse Backpackers in downtown Christchurch. 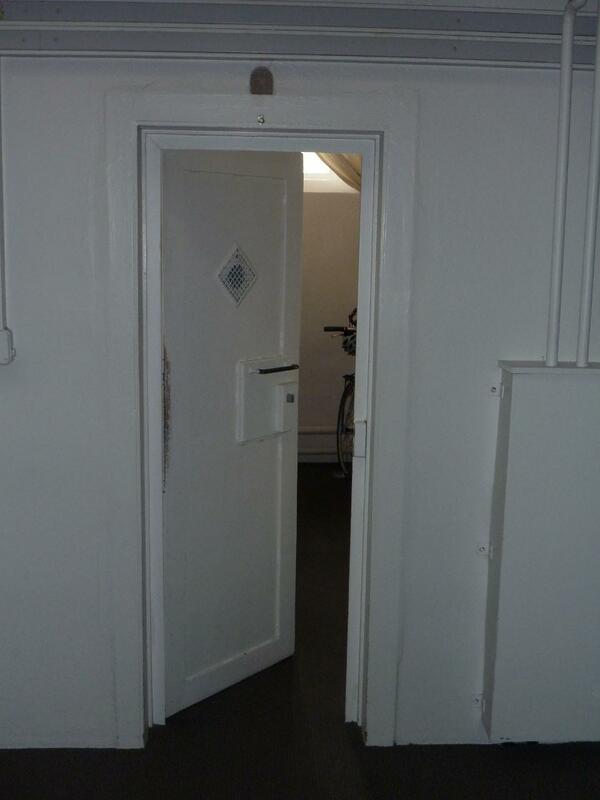 The heavy steel door to our cell from 1874. 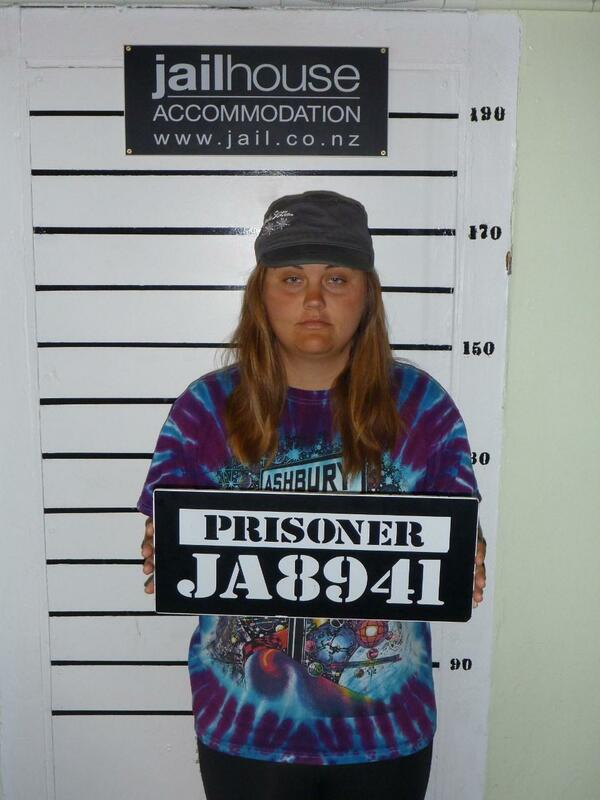 A model prisoner. This is what 39 days of hills does to you! On the way for a ride through Christchurch for the bike return. No panniers! 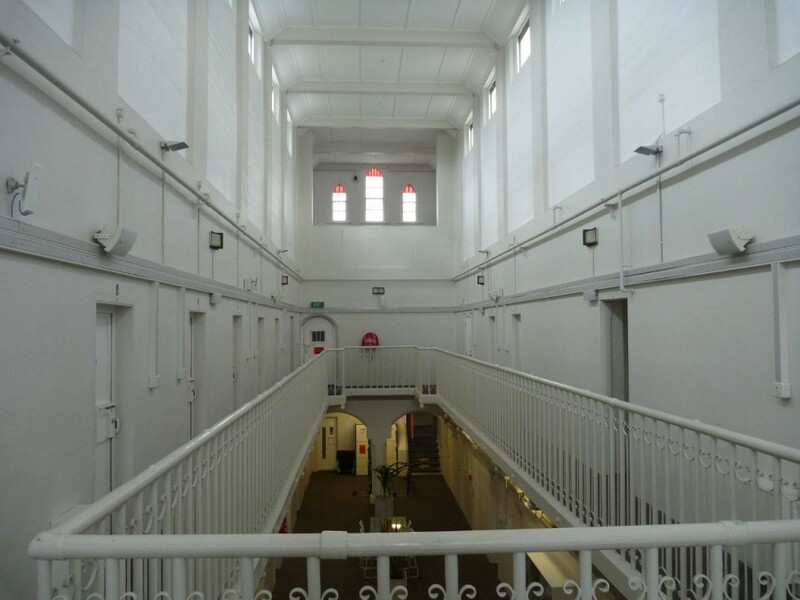 A few more jail pictures. 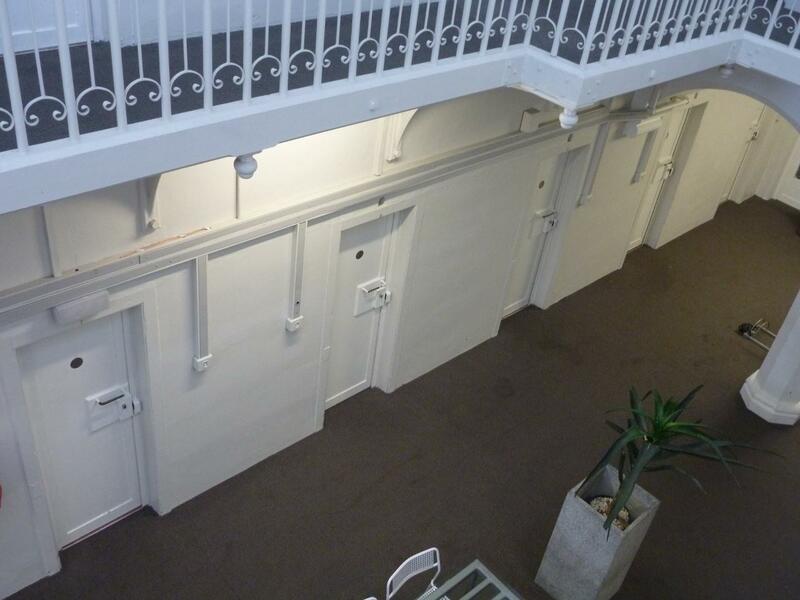 The 2nd floor. Part of the lounge area. Jocelyn working on her Facebook update. Riding through rush hour in Christchurch. A little different than our last 39 days in the country. Our ride is complete but the adventure will continue in Bondi Beach, Sydney. We covered quite a bit of the South Island. Thanks Natural High. We are proud of our hill climbing. Another tattoo! And yes I have a matching one. 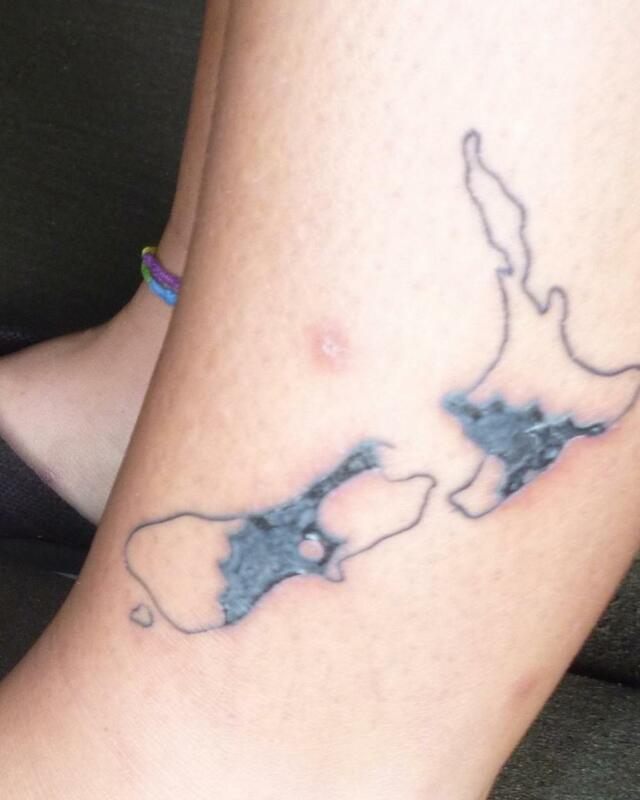 We had this done in Queenstown. It is scabbing over now. That is a bicycle gear inside the islands of New Zealand. Mine doesn’t look as pretty! We are still recovering from the sandfly bites. After 39 days on a bicycle what do you do? Go surf! Even though the water was a cool 14.5 degC (58.1 degF) we had a great time in the small surf. 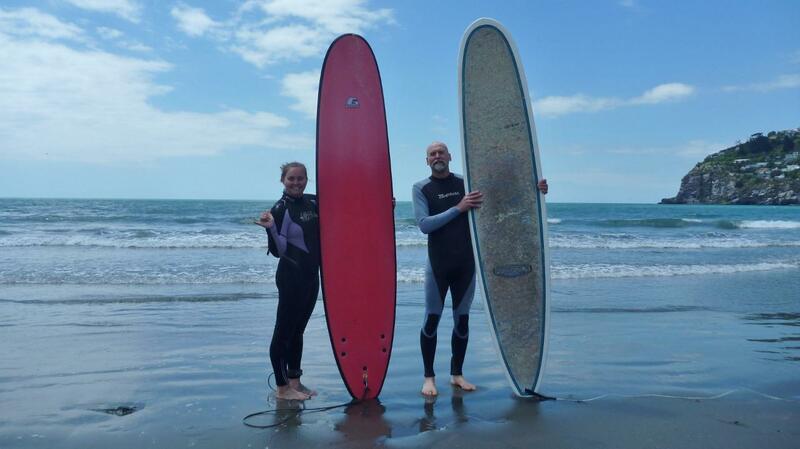 This was our first time surfing in the South Pacific! After 1 1/2 hours our feet were numb so we got out. I haven’t surfed since January so the water and paddling was much needed. And it was quite warm compared to my last time in the ocean – Antarctica’s Ross Sea at 28 degF. Our 39 day route of 1100 riding miles and 600 bus miles.